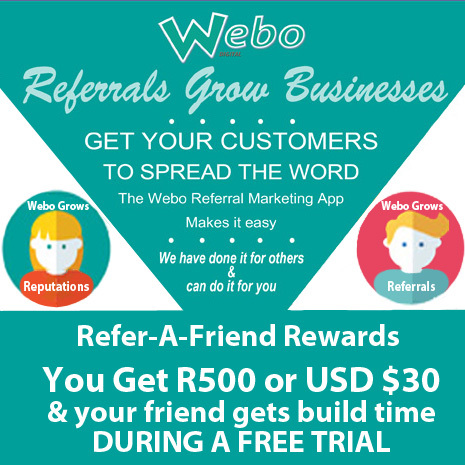 Please link to www.refer-a-friend.webo.directory to obtain a refer-a-friend coupon that you should use for sharing. To claim the Refer-A-Friend rewards both parties; The Webo SaaS Advocate (Advocate) and the Friend or Business Connection (Friend) must register their participation in the programme. The Advocate must create their own unique eight digit (numbers, letters and characters) promotion code which must be entered in the top row of the coupon. The Friend must enter this promotion code on the SaaS signup form (No Credit Card is needed – you only have to verify your email address). The Friend must also enter the Name and Surname (spaces are permitted) of the Advocate who sent the referral coupon in the ID Number* field on the signup form. The Friend must contact us to request the activation of the Loyalty & Referral Communicator App in their Admin Panel. All terms not otherwise defined herein shall have the definitions advised by Webo Digital. These Referral Programme Terms and Conditions ("Terms and Conditions") govern Your participation in the Webo Digital Referral Programme (the "Programme"). Advocates may refer friends and business connections to the Webo SaaS Loyalty and Referral Communicator App by e-mailing a coupon to your Friend. Friends are entitled to a fourteen (14) day free trial of the Webo Digital SaaS Package. In addition, Friends may book a one hour dedicated support service to assist with the building of a Webo Communicator App. The availability of build support bookings is subject to availabity. Only new and returning Webo Digital customers that have not been customers in the past twelve (12) months are eligible to redeem this Referral Offer. Once a Friend subscribes to a Webo Digital Digital SaaS Package for at least 3 monthly billing cycles, Advocates will be eligible as a South African resident to receive R500 (payable by EFT) or if an Advocate is a resident of another country the equivalent of a USD $ 30 Referral Fee (payable by Paypal to your Paypal account). Once Advocates become eligible for the Reward, We will make the Advocate payment within 15 days. By participating in the Programme, You will submit personal information about Yourself and Your friends, such as names, e-mail addresses, and your Paypal account details which may be shared with a Webo Affiliate (for the purpose of offering assistance) or with any Webo third party Programme administrator (to effect payment). You may not participate in the Programme where doing so would be prohibited by any applicable laws or regulations. You must be eighteen (18) years or older and a resident of a country that you advise is your domicile. In addition to the restrictions You agree to Our Terms and Conditions and you agree that the following activities are expressly prohibited and engaging in any of these will be grounds for immediate termination and disqualification from the Programme, and may lead to the forfeiture of any existing Programme invitations without compensation. Prohibited activities: Spam, bulk distribution of invitations, distribution to strangers, or any other promotion of Your Programme invitations that would constitute or appear to constitute unsolicited commercial e-mail or spam under any applicable law or regulation. Fraud, attempted fraud, or abuse of the Programme or these Terms & Conditions. Selling, trading, bartering, or providing anything of value to Your Invitee beyond the Programme invitation, or otherwise using Your Programme invitations or Rewards for promotional purposes. If You do not comply with any of these Terms and Conditions, Webo and any division of Webo reserves the right to terminate and disqualify You at any time from participating in the Programme. We reserve the right at any time to modify or discontinue the Programme, either temporarily or permanently (or any part thereof), with or without notice. We will not be liable to You in the event of any modification, suspension or discontinuance of the Programme. We reserve the right to amend, modify or waive these Terms and Conditions at any time in our sole discretion.